Exemplary researchers were selected to represent each college. Front row, from left: Professor Linda Steiner (JOUR), Professor Rajshree Agarwal (BMGT), Professor Gregg Vanderheiden (INFO), Assistant Professor Marccus Hendricks (ARCH), Professor Ralph Dubayah (BSOS), and Professor Ellen Fabian (EDUC). Back row, from left: Professor Amy Sapkota (SPH), Vice President for Research Laurie E. Locascio, President Wallace D. Loh, Senior Vice President and Provost Mary Ann Rankin, and Associate Professor Liangbing Hu (ENGR). 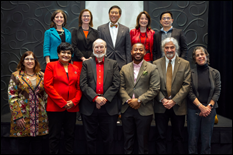 Not pictured: Distinguished University Professor Emeritus David Driskell (ARHU), Distinguished University Professor Christopher Monroe (CMNS), Professor Utpal Pal (AGNR), and Professor Peter Reuter (SPP). More than 200 University of Maryland researchers and scholars were honored at the inaugural Maryland Research Excellence Celebration on February 28, 2019. Co-hosted by Senior Vice President and Provost Mary Ann Rankin and Vice President for Research Laurie E. Locascio, the program held at the Hotel at the University of Maryland recognized the distinct, high-impact accomplishments of the campus' scholarship and research community. The guests of honor were nominated by their college and school deans for demonstrably elevating the visibility and reputation of the university through transformative findings, achievements with evident societal impact, recognition by national or international groups, high-impact publications and significant external research funding.“The creativity and ingenuity of our faculty have propelled our university’s profile as a preeminent institution for research and scholarship,” Locascio said. The Division of Research also announced the winners of its 5th Annual Research Communicator Impact Award, created in 2015 to recognize faculty members who proactively communicate their scholarship and research findings or opinions on research issues with the greater public. The faculty cited in media category recognizes faculty who were quoted or referenced in several articles of in multiple, high-impact news outlets. The winner in this category is Lilliana Mason, assistant professor in the Department of Government and Politics in the College of Behavioral and Social Sciences. Her recent research is transforming the way we think about partisanship, and it is doing so in an environment of deepening conflict and incivility. In addition to being cited by high-impact media outlets like Vox, Science Magazine, the Washington Post, the Economist, and the New York Times, to name a few, Mason’s research was the subject of several podcasts, and radio and broadcast interviews. The op-ed category highlights those who have authored opinion, editorial, and thought pieces in prominent news outlets. Sahar Khamis, associate professor of communication in the College of Arts and Humanities, received the award in recognition of the multiple op-eds she authored in 2018, in which she shared her expertise in Arab and Muslim media. Following the murder of Saudi journalist and Washington Post columnist Jamal Khashoggi, she wrote an op-ed for The Conversation, titled “Jamal Khashoggi’s murder finally brings media attention to the plight of Arab world’s exiled critics.” This op-ed led Khamis to publish more opinion pieces, sparking media attention and interviews by several outlets. The new media category recognizes faculty who have produced videos, blogs, radio segments, podcasts, and other works of new media. The winner of this category is Patrick Warfield, associate professor in the School of Music in the College of Arts and Humanities. To help commemorate the centennial of the first World War, Warfield – a musicologist – presented research on music’s transatlantic impact at conferences and in scholarly articles. He then transformed this scholarship to curate and narrate three free performances in the Washington, D.C., area, culminating in a final concert featuring members of the Washington National Opera’s young artist program at the Kennedy Center’s Millennium Stage. The following is a list of all honorees celebrated at the Inaugural Maryland Research Excellence Celebration. An asterisk denotes special recognition, based on selection by each college or school dean, as an "Exemplary Researcher."